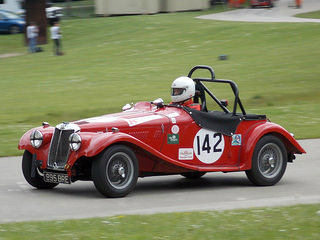 In 1950, the MG TD Midget sports car was introduced. 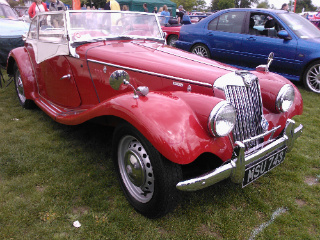 Like its predecessors, it was a two door, two seater roadster and, in many ways, it was similar to the MG TC. A somewhat strange omission was the fact that the TD did not have a fuel gauge. Instead, there was a green light on the dashboard which flashed a "warning" message when the fuel tank contained only 2.5 gallons. Later, in 1950, the MG TD Midget Mark 2 sports car, also called the TD Competition Model, was introduced with additional factory accessories together with tuning equipment. 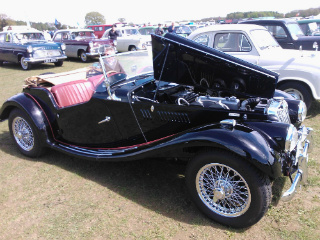 This roadster was fitted with two fuel pumps, modified steering dampers, wider wheels, two larger SU carburettors, and a higher back axle ratio to improve long distance driving. 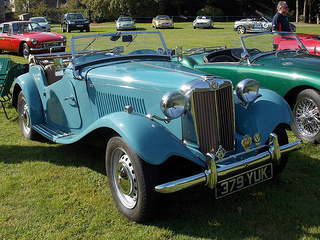 The MG TD Mark 2 was manufactured alongside the TD Mark 1, and used an XPAG engine with the compression ratio increased from 7.25 to 8.1:1 so marginally increasing the power output. This model was aimed at the export market. Since, in the UK, a lower octane fuel was still only available due to post war restrictions, the TD Mark 2 would not have been suitable for that market. When production ended in 1953, almost 30,000 MG TD Midgets were built, which also included about 1,700 of the Mark 2 model. Production of the TD peaked in 1952, and by 1953 when manufacturing ended, sales were distinctly tailing off. What was needed was a new roadster. Apart from 1,656 units destined, presumably, for the UK market, all the production was exported, with 23,488 units sent specifically to the US. 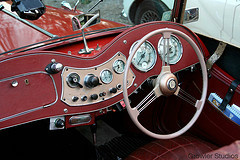 The main complaints from US owners were the absence of water and fuel gauges, and the adoption of a 12 volt electrical system unique to the UK. In 1953, the MG TF Midget sports car was launched. It was offered as a two door, two seater convertible. 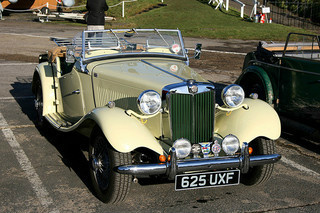 The TF was, essentially, a facelift of the previous MG TD. The chassis, suspension, brakes, steering, engine and transmission remained unchanged. It used the TD's Mark 2 XPAG engine in which the compression ratio had been increased to 8.1:1, the valves had been enlarged with stronger valve springs, and two larger SU carburettors had been added. Since management would not sanction a redesign of the TD, then MG simply made some cosmetic changes to the body styling, and renamed it the MG TF. Following the launch of the TF, it was immediately rejected by the market who could see through the companies' intentions. 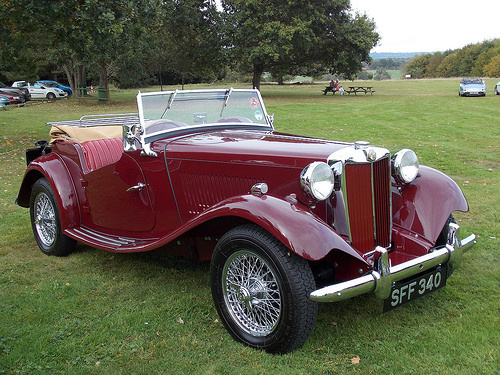 In 1954, the MG TF was fitted with a revised version of the XPAG engine, which was designated the XPEG. This involved the former unit being bored out to 1.5 litres, the compression ratio increased from 8.1 to 8.3:1, and the torque increased by 17%. 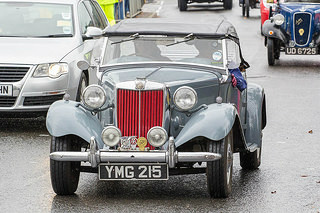 The updated roadster was now renamed the MG TF 1500, and was identified, externally, by an enamel nameplate on the side of the bonnet. Addition of the XPEG engine definitely improved performance but, by 1955, it was obvious that a more up-to-date sports car was needed. Therefore, after only eighteen months in production, the MG TF Midget was finally retired. 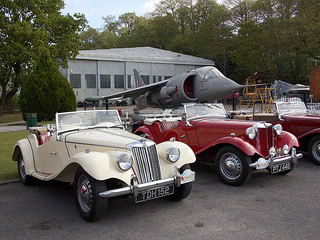 The market awaited the introduction of its successor, the MG MGA. 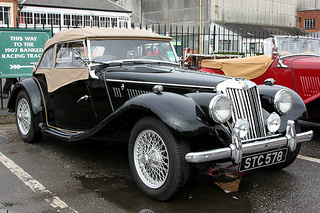 Depending on condition: A 1950-53 MG TD would sell for between £7,000/$11,000 and £24,000/$38,000. 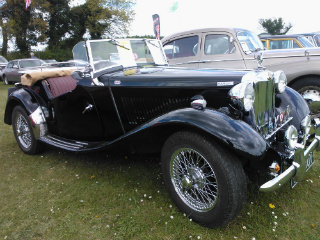 A 1953-55 MG TF would sell for between £8,000/$13,000 and £28,000/$45,000.